Here is the last in a series of extracts from Graham Little’s evening at the club, organised by the Argyle Archive in September 2017. 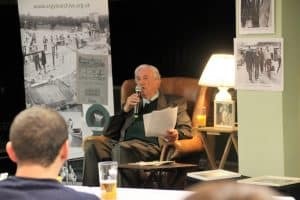 Now in his nineties, Graham was Club Secretary between 1965 and 1991 and for well over two hours he entertained us with fascinating and often amusing stories about his time at Home Park. Choose the last in the list for more stories from the 70s and 80s, including Robert Maxwell, Johnny Hore and Elton John. Please feel free to add any comments below. What a lovely and dedicated man to the club. Nothing seemed too much for him and his commitment over the 26 years of devoted service is to be commended. I was lucky enough to have received a letter from him when, as a young fan, I was knocked down on the way to a match and he saw a brief report about this in the Herald and wanted to wish me a speedy recovery. I was only bruised but in pain and his letter made me feel much better. Wouldn’t it be nice to have some part of the new ground named after him, say, “The Little Bar” or “The Little Lounge”? © 2017 Plymouth Argyle Heritage Archive. Content must not be copied without express permission.